Safe operation of electrical and battery installations is assured by restricting unauthorized access to sensitive and potentially hazardous equipment. 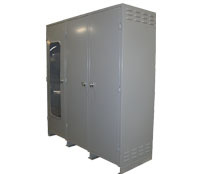 HBL offers a full range of customized battery cabinets to house your battery and ensure safe operation. Our battery enclosures are designed and manufactured in the USA to meet the exact specifications of our customer. Depending on the application requirements, an enclosure may be a single compartment that houses just the battery or multiple sections that accommodate batteries and electronics. Enclosures are available for indoor or outdoor installations, with or without windows. To further accommodate the specific requirements, a host of optional accessories is available. HBL cabinets are built to comply with industry standards- NEMA,IEC, and UL.